FHA Mortgage Applicants with Recent Foreclosures Offered a Pass | The Law Office of Emil Fleysher, P.A. FHA Mortgage Applicants with Recent Foreclosures Offered a Pass | The Law Office of Emil Fleysher, P.A. 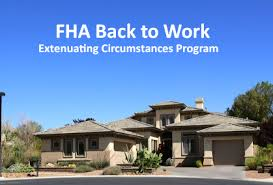 The Federal Housing Administration has instituted a new program called “Back-To-Work-Extenuating Circumstances” to assist potential borrowers who faced financial hardship during the recession. This program, which began August 15th, 2013 provides a second chance for mortgage applicants who have experienced financial hardship such as unemployment or a severe reduction in income beyond the borrower’s control. This program is designed to assist borrowers with a recent history of foreclosure, judgment, short sale, bankruptcy, loan modification, or deed-in-lieu by acknowledging that their credit history may not fully reflect their ability or propensity to repay a mortgage. Prospective borrowers that have experienced an economic event and can document that the event was out of their control, that they have recovered, and that they have completed housing counseling can apply for an FHA-insured mortgage that will allow up to 96.50% financing.